Sadly, we see a lot of questions like this. We at Wondershare – the publishers of dr.fone and other software – make it our primary purpose to help our customers. In the situation where you might need to recover data from a water damaged iPhone, we think the first thing is to calmly assess – as calmly as you can! – the situation. Power and start-up issues: unable to be turned on, restarts immediately after turning on, or the white screen of death. Hardware failure: the speaker does not work, the microphone is not working, or your iPhone is overheating. Warning messages: you may get one or more error messages when you use the iPhone, messages you have not seen before, like "This accessory is not made to work with iPhone" or "Charging is not supported with this accessory. ", etc. Application issues: Safari browser, email or other programs opening and closing without reason. If you are still not sure about it, Apple have given you some extra help. Please turn your phone off first, then study and take advice from the diagrams below. 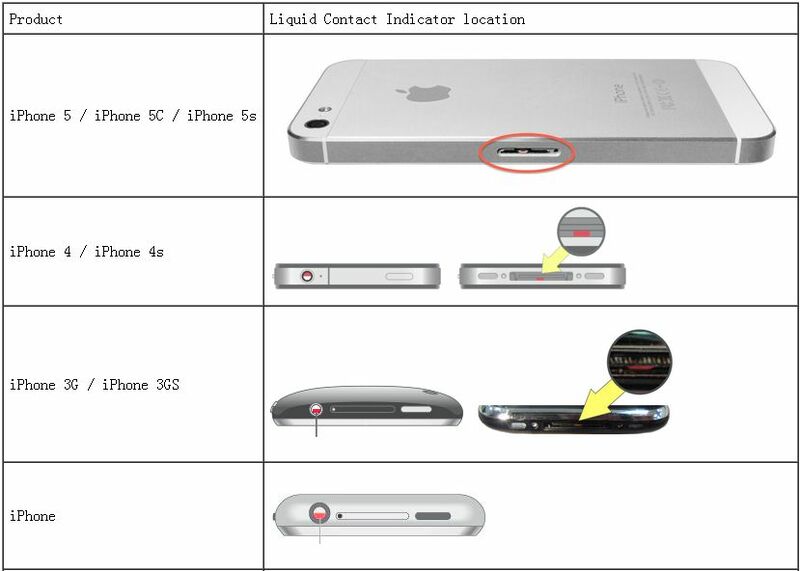 When your iPhone has been exposed to water, you'll see a red dot. If not, congratulations! Your iPhone is not water damaged. If you think that your iPhone was water damaged, don't use it at all. First, obviously, move it away from the water source, then power it off. Using any sort of drying device, is as likely to push the water further into the phone as anything. Do you know those small bags which come with your new camera, your new TV or, indeed, your new phone? They contain silica and that is the best thing to use. Put your phone in a container with silca bags (which can be purchased at a number of places), or with uncooked rice, for a few days to dry it out. Visit a reputable repair store. The popularity of iPhones means that new solutions are always being developed, including possible solutions to this sort of problem. It will be a great comfort for you if you know you have a backup of your data. Of course, we think the best way to do that is by using dr.fone - Backup & Restore (iOS). However, a reasonable start would be to use iTunes. Apple provide you with a basic backup system. Backup your iPhone data with iCloud: Go to Settings > iCloud > iCloud Backup. We think there is a better approach. As the name suggests, dr.fone can help you to perform many troubleshooting tasks on your iPhone. This includes data recovery from an iTunes backup file, or from iCloud backup, or by using the system recovery for iOS devices. Let us walk you through the steps, to show you the ways in which you might recover data from water damaged iphone. Our dr.fone toolkit does this easily, and so much more! Check out more to recover data from broken iPhone or how to backup iPhone without passcode. Usually, when an iPhone is water damaged, you would take it to the repair shop. They would usually restore it to normal but will not retrieve your lost data. Being calm and rational, the highest priority must be recovering your data. The good news in all of this is that you do not need to take valuable time to go to the repair shop, you can almost certainly achieve what you want without leaving home via dr.fone - Recover (iOS). We are here to help. Download and install dr.fone to your computer. Run the program and you will see the window shown below. Attach your iPhone, then select 'Repair' and simply click 'Start' to scan it. The opening window – dr.fone's dashboard. When the scan has completed, you can take the time to preview check then select which items you wish to recover. Just put a tick in the box next to the items, and click 'Recover' to save what you want to your computer. 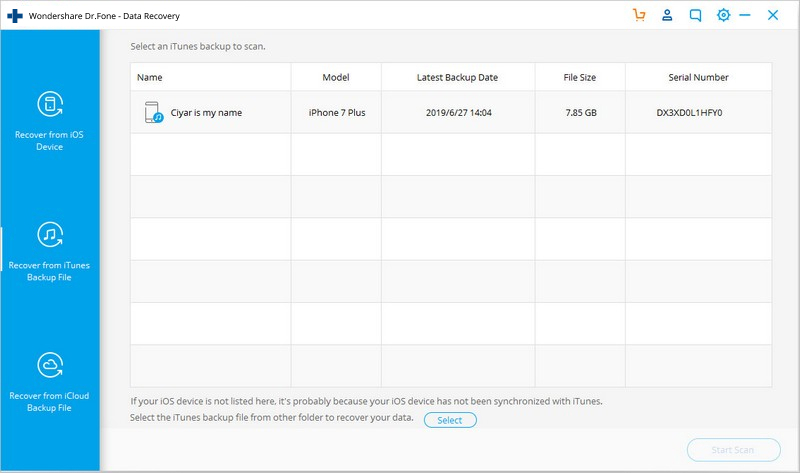 As we have shown above, iTunes can be used to automatically backup the data on an iPhone, iPad or iPod Touch. 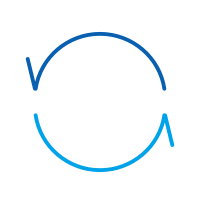 It is a normal part of the process when syncing your device. 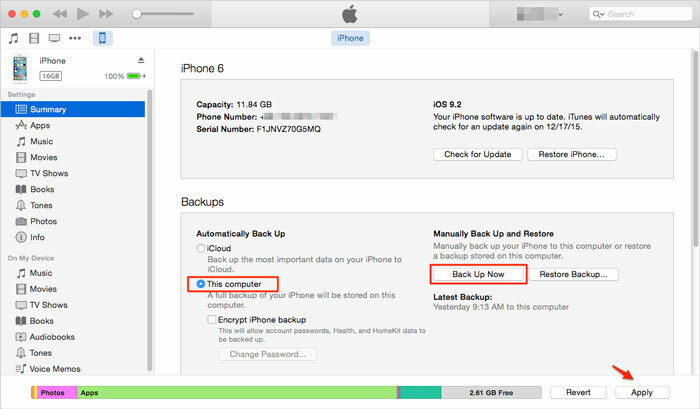 After losing data, such as your iMessages, you can directly restore the backup to your iPhone. 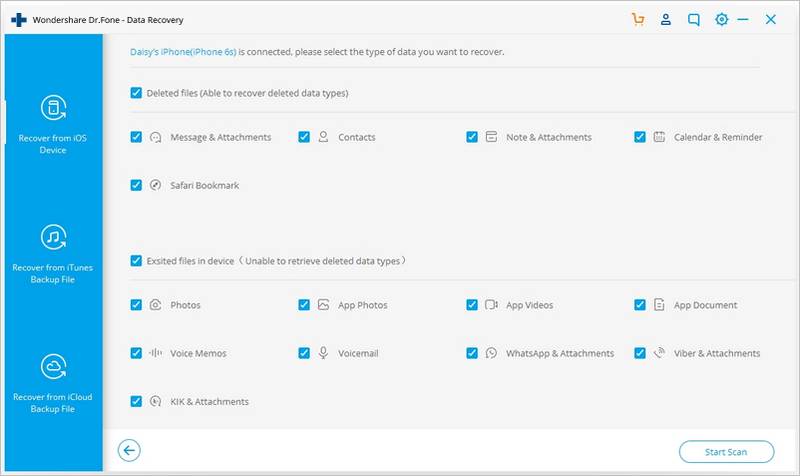 We, of course, would like you to consider the advantages of using dr.fone toolkit in helping you to recover deleted data. It is your choice. 'Free' always sounds good. If you have already downloaded and installed dr.fone, run the program and select 'Repair'. 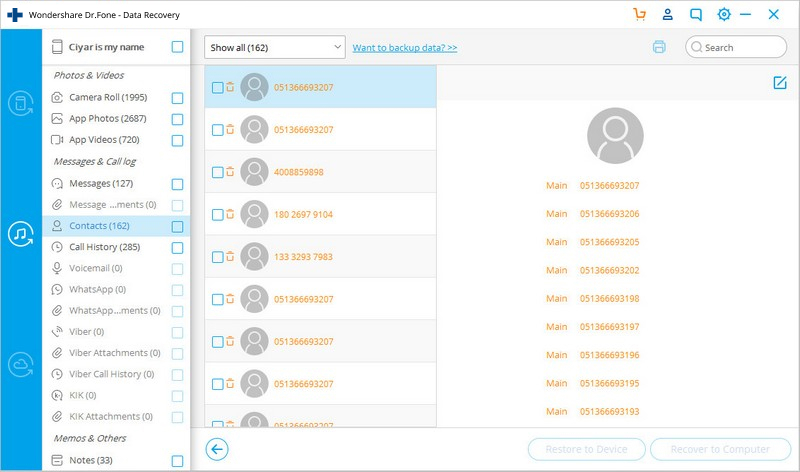 The backup files for your device type will be listed automatically (see the screen shot below). It will usually be the right decision to choose the most recent backup. Then click Start Scan to begin extracting all your data from the backup. iTunes cannot do this. Only dr.fone can check and extract just what it is you want. When the extraction completes, the whole of the contents of the backup file are displayed in detail. Select, by putting a check mark in the boxes, the items which you want. You can see them listed on the left side on the window. 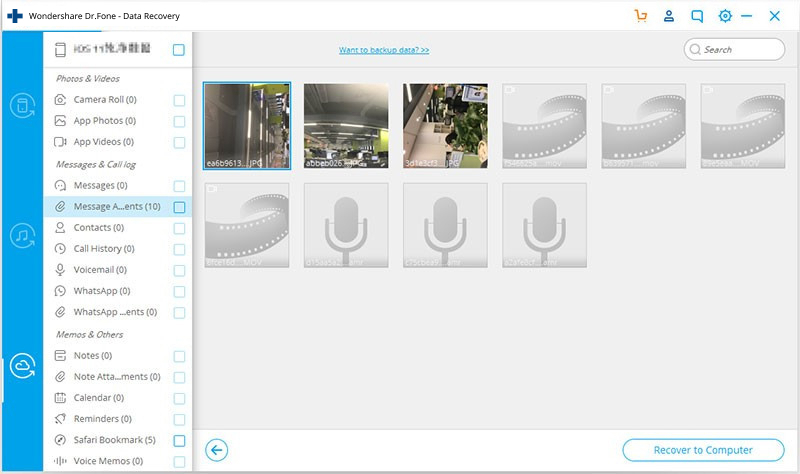 You can preview detailed contents of all types of files. Click the 'Recover' button on the top of the window, you can save them on your computer, and with one simple click you can recover just what it is you need. Maybe it hasn't been such a disaster, and you can recover data from water damaged iPhone. 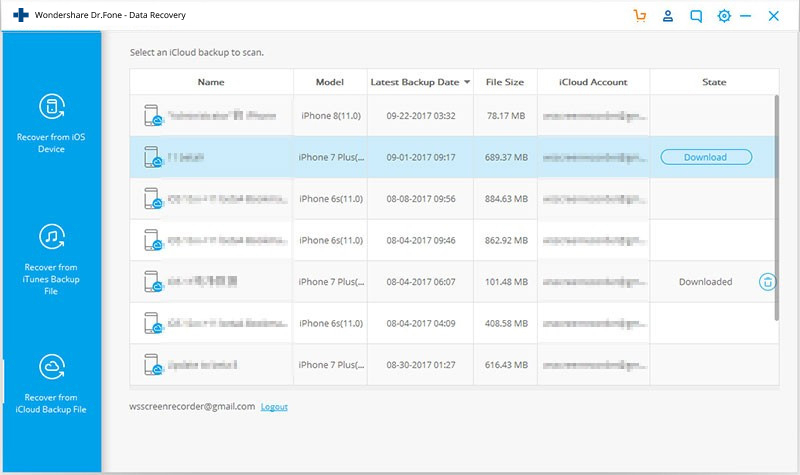 To restore our personal information from iCloud backup, you need to restore the whole backup by setting your iPhone as a new device first. That is the only approach which Apple offers you. If you do not want to do it in this way, you can also use dr.fone - Recover (iOS). 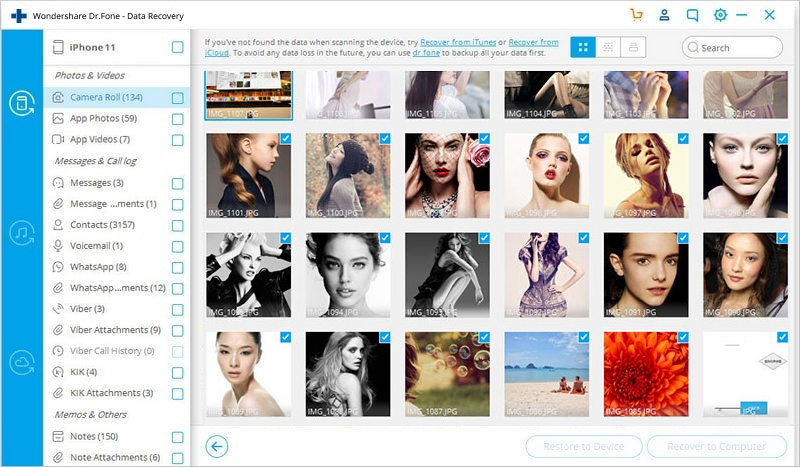 It lets you access, preview and selectively recover whichever photos, music, messages, addresses, messages... etc., which you might want from your iPhone. 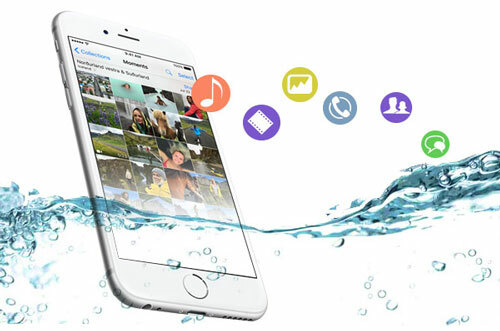 You can retrieve data from water damaged iPhone. When you have dr.fone running on your computer, go to the recover mode of 'Recover from iCloud Backup File' at the top of the opening, dashboard window. Then the program will present you a window for logging in your Apple ID. Please do so and be assured that dr.fone takes your privacy very seriously and keeps no record beyond your original registration with us. We hope you have this information to hand. 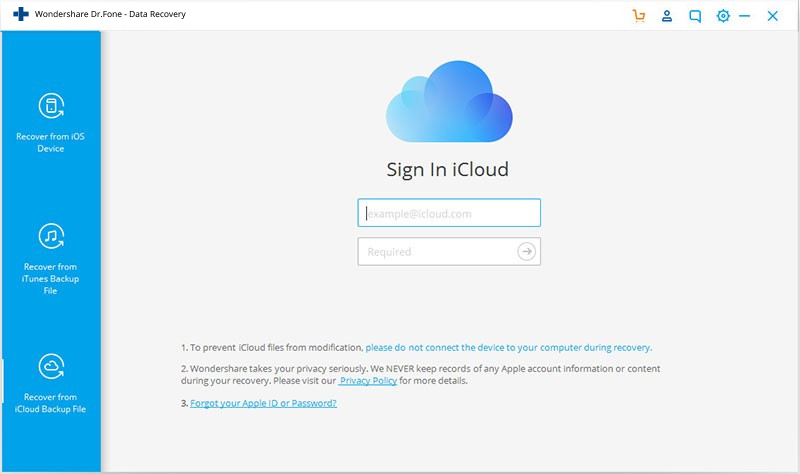 Once you are logged in, the dr.fone will automatically find all your backup files in the iCloud account. Choose the one you want, probably the most recent one, and click to download it. Then you can scan it with just one more click. The scan will take a little while, typically 5 minutes. When it finishes, you can read all the data found in your iCloud backup. Choose just what you want, and save it to your computer by clicking on the 'Recover' button. All of us at Wondershare, the publishers of dr.fone and other great software tools, see our primary role as helping you. That approach has proved successful for more than a decade. We would very much like to hear from you with any questions, any opinions, which you might have. Did you lose data on your iPod Touch? The following are just some of the ways you can get it back. This article tells you why voicemail can be retrieved and how to retrieve deleted Voicemail on iPhone in 3 ways. Check in for the details now.